LED outdoor flash with bright light key chain and whistle compact and lightweight.Comes with 2 light diffuser cap on to the end of a flashlight to convert it to a camping lantern,Perfect suitable for household, outdoor activities, hiking, night fishing, camping. LED outdoor flash with bright light key chain compact and lightweight. Constructed heavy duty stainless steel, makes it durable for long time use. Small in size but output brightness can achieve up to 200lumen. 3-mode adjustable High,Low,Strobe and can also adjust when wearing the diffuser cap. Whistles with excellent airflow design, easy to whistle and make a loud up to 125db. Rotary light head on/off switch for easy to operation. 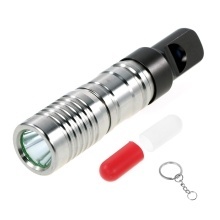 Comes with 2 light diffuser cap on to the end of a flashlight to convert it to a camping lantern. Perfect suitable for household, outdoor activities, hiking, night fishing, camping.